The Renault Captur is certainly an attention grabber. It would seem that Renault have applied their imagination here, but infused it with an inventiveness steeped in logic that always takes into account the customer. It’s a car that benefits from some super-economical engines, French style, as well as versatility. Whether you’re a supermini or a hatchback buyer, the Renault Captur might cause you to stop and think. Let’s take a closer look at what the Renault Captur offers. Most Renault Captur Crossover’s sold will come with 90bhp engines, but there will be a few consumers who opt for the beefier 120bhp 1.2-litre TCe petrol unit, which comes with a twin clutch 6-speed EDC Renault Captur automatic gearbox. But there is a premium to pay for this which will prove to be a stumbling block for drivers. So, back to the 1.5-litre dCi 90bhp diesel setup that most drivers will settle for. You can get to 62mph from rest in 13 seconds en route to a top speed of 106mph, which is pretty much what you’d get from the three cylinder 0.9-litre TCe 90 engine, which actually generates 50% less power. 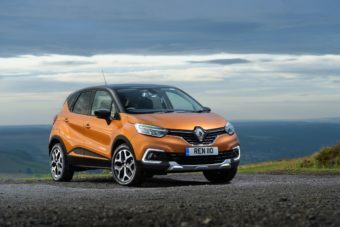 Overall, the Renault Captur is decent to drive, with drivers feeling as though they’re inside a supermini from the moment they take their position in the heightened driving position. Because of the somewhat commanding driving position, the French brand have added Roll Movement Intervention, which prevents extra body roll when turning through corners. This doesn’t in any way mean the Renault Captur is an off-road brawler, though, because though it comes with 200mm of ground clearance, it’s entirely front wheel drive. Renault claim that their Renault Captur is a car that is ‘passionate, practical and innovative.’ Whether you agree or not will depend on your own perception, although it certainly does cut a striking figure. But in terms of practicality, families can’t really be subjective – either a car is practical or it isn’t. For most families, the Renault Captur Crossover will probably score fairly well on this front, offering as it does the kind of space we’ve become accustomed to from, say, a Ford Focus. The boot offers 377-litres of space which can be increased to 455-litres if you flip the rear seats, whilst headroom and legroom is pretty good, both up front and at the rear. Innovation and passion is a little harder to spot. The dashboard has been taken from the Clio, which is hardly innovative, although Renault does claim this dash design is ‘modern, welcoming and occupant-friendly.’ We can’t argue with those words, and this is very much a family car that tries hard to be welcoming and friendly. The Renault Captur also comes with some very deep cubby holes which will prove their worth, as well as their patented removable seat covers (I guess these are innovative, right?!). One thing the Renault Captur Crossover is is affordable, with Renault Captur deals starting from around £13,000 and rising to about £17,000. It’s a humble pricing bracket that will appeal to families looking to go for something a bit more trendy and buy into the increasingly appealing Crossover market. Just two engines are offered, both of which generate 90bhp, whilst there is no 4WD option. Standard specs include air conditioning and front fog lights for most models, whilst all variants are treated to alloys, cruise control, a trip computer, as well as daytime running lights. The new Renault Captur is also incredibly economical too, with the pick of the bunch being the three cylinder TCe 90 unit returning 56.5mpg whilst emitting 115g/km. Okay, so whilst it’s not always that easy to spot passion inside – you have to look at it a bit more subjectively; the real passion has come from the brand themselves, for whom the Renault Captur Crossover is clearly a labour of love. It is a fascinating car that comes attached with some big hopes (and some big words too), and in its mixture of being an SUV, MPV and family hatch, it’s struck a pretty decent balance between all three. Practical, striking to look at, it’s also pretty darn efficient. If you want to get hold of the new Renault Captur don’t hesitate to leave us a message on our contact page, or give us a call on 01903 538835 to find out more about our Renault Captur finance and Renault lease deals.